^ Gelb, I. J. (1963). A Study of Writing. University of Chicago Press. ^ Sampson, Geoffrey (1985). 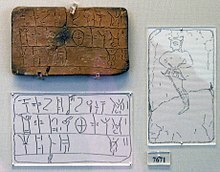 Writing systems: a linguistic introduction. Stanford University Press. pp. pp.38-41. ISBN 0804717567. Daniels, Peter T. (ed.) and Bright, William (ed.) (February 1996). The World's Writing Systems. Oxford University Press. ISBN 9780195079937.